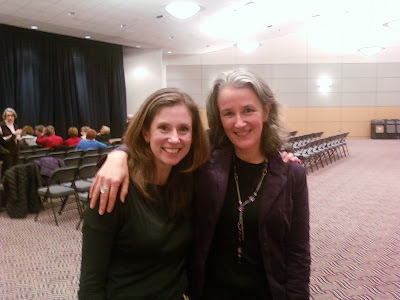 On Tuesday November 11, Tatiana de Rosnay and I met in person. After years of connecting through MySpace, Facebook, and e-mail, I finally met my friend from across the pond. One of the women at Beth Shalom in Northbrook selling Tatiana's paperback edition of Sarah's Key thought we were related. Guess that sliver of French and chunk of English worked out. 2008 ended up an Annus Horribilis for my husband, friends, and me, yet finally meeting Tatiana in person proved to be a ray of light that helped further shatter the darkness. She's a beautiful person and artist who gives of herself to others. As I've said in previous posts, that combination are indeed rare and special. I'm blessed to call her my friend and am so grateful we connected via the web a few years ago. Her Sarah's Key presentation at Temple Beth Shalom was beyond remarkable. Learning more about the passion and drive she had for Sarah's story and revealing the Vel d'Hiv atrocity proved inspiring for me on multiple levels.